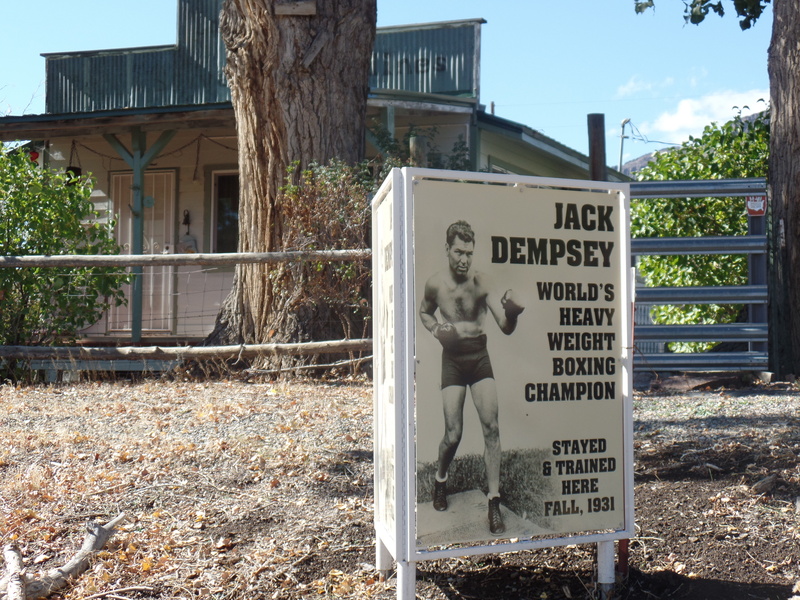 What to do in Winnemucca? 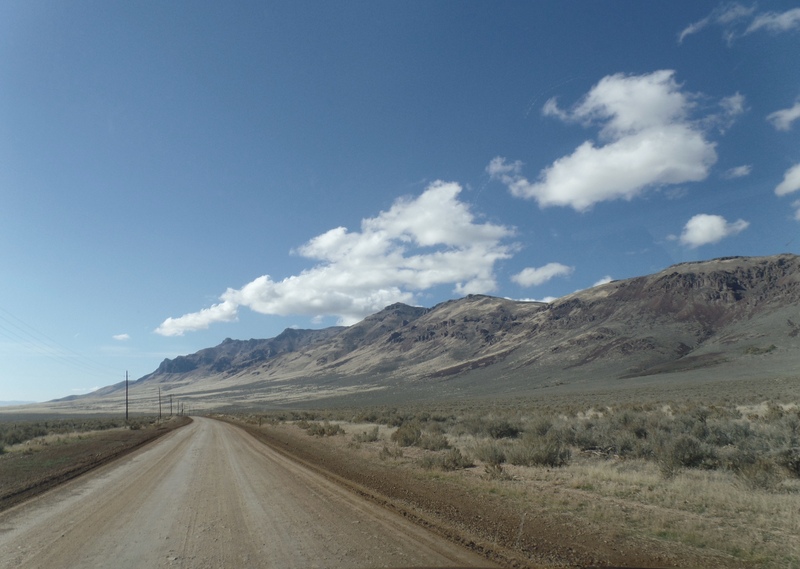 We made the decision to stay the extra night in Winnemucca so on Wednesday we had to figure out what we could do in Winnemucca, NV. 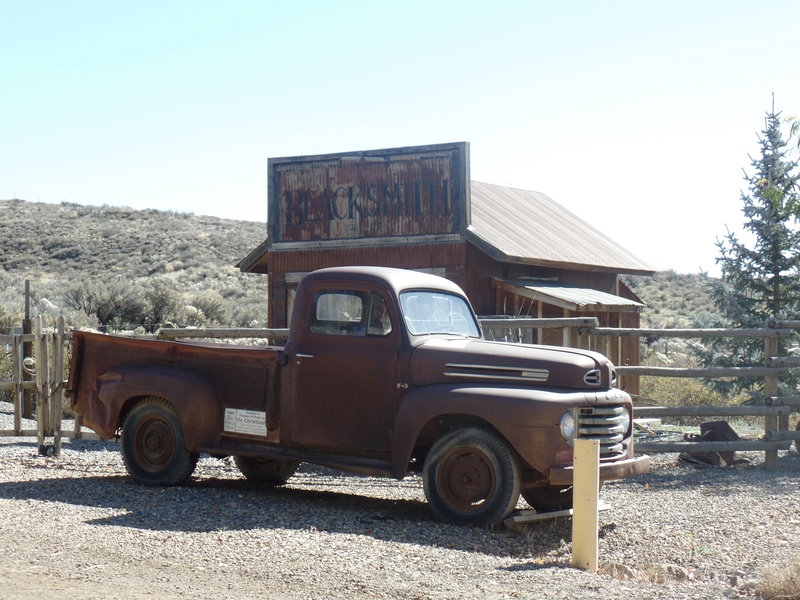 Our first stop was at the bureau of land management office just down the road from the RV park. We were helped by a very nice gentleman named Rusty. 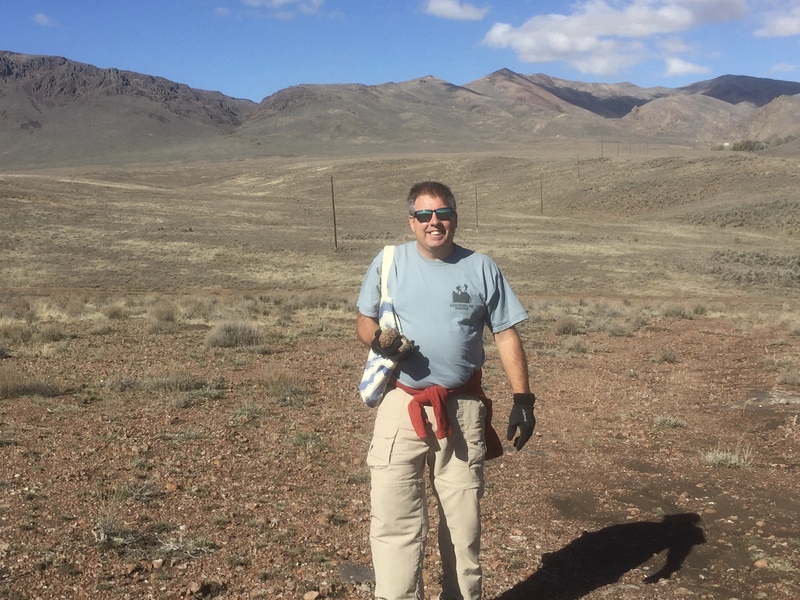 He let us know about a location in Midas, NV where we might find geodes. This sounded interesting to both John and I so after arming ourselves with a map and directions from Rusty we were ready to give it a try. Gizmo got to come into the office at the bureau of land management and had a photo opportunity with Rusty before we were underway. We headed east on I-80 to the Golconda/Midas exit. We then followed route 789 for about 17 miles until we reached a right turn on to the Midas road. We traveled on this dirt road for 28 miles. The dirt roads here are much better than dirt roads in Maine and we were able to move right along. We saw very little vehicle traffic on this road. 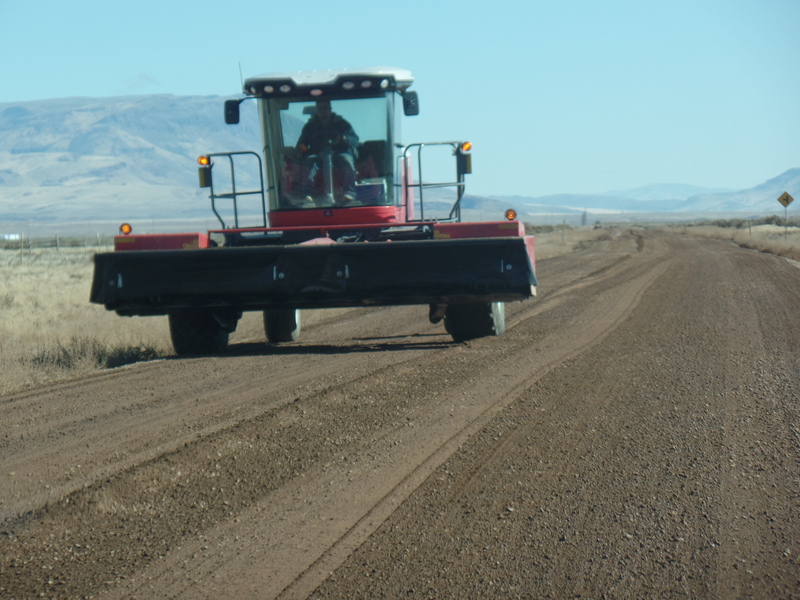 They were grading the first part of the road so we had negotiate around some big equipment. We were truly in the middle of nowhere Nevada. 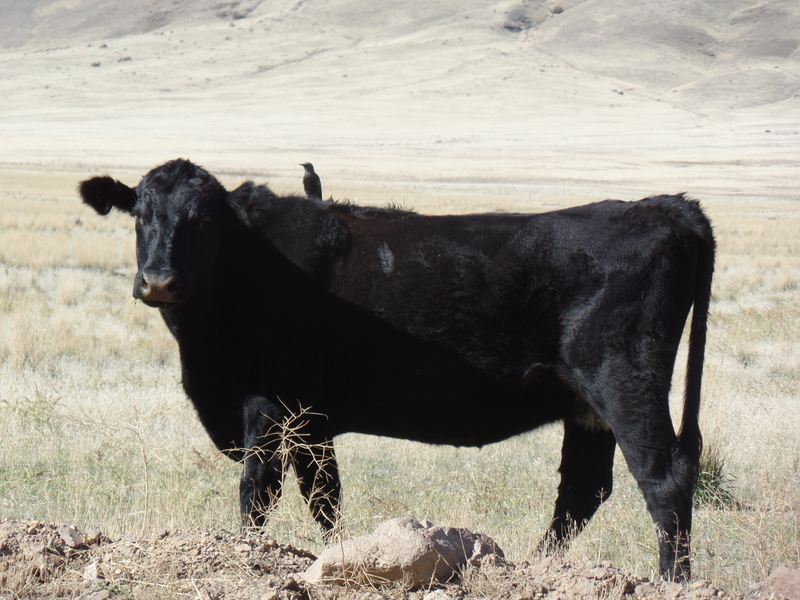 There are tons of mountains and fields full of free range cattle. We arrived at a T-junction at the end of the 28 miles. We couldn’t remember what to do from here. We took the right turn and followed it up to the Midas mine. This was not the right direction but we did check out the huge mining operation going on, but never asked what they were mining. John spoke with a geologist in the mine who suggested we go back to the the T-intersection and follow it towards town. 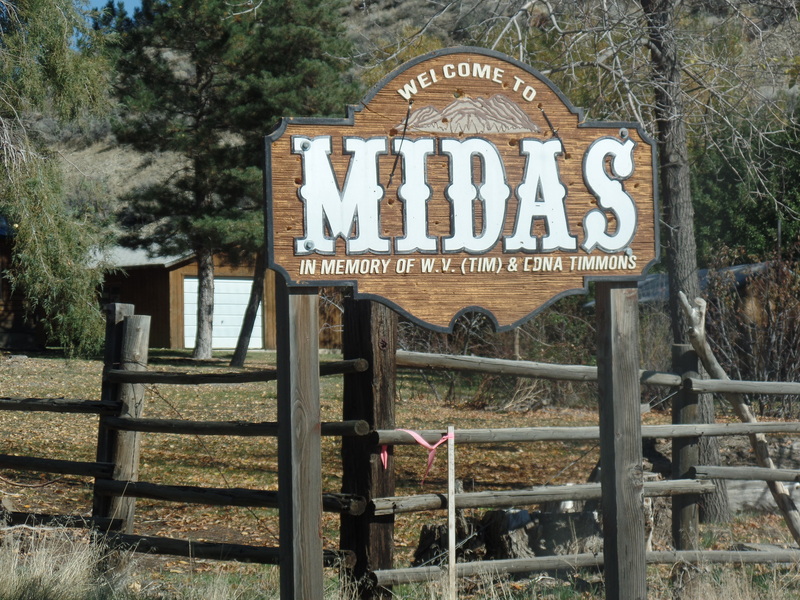 We drove back down to the intersection and followed it into the very tiny town of Midas. We took a few minutes to take some photos of this very eclectic town and checked out the burger joint that Rusty had recommended. Unfortunately it was not open. We were looking for a side road with a gate that we never found. 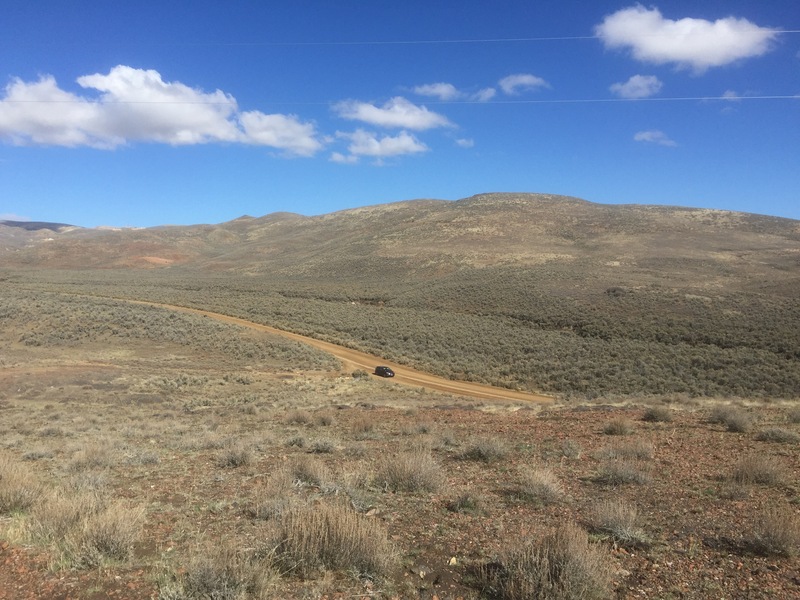 We called Rusty at the BLM office and he gave us more details on what we were looking for. We drove back out of town towards the T-intersection and parked on the right approximately 1/2 mile from the T-intersection. There is a little pull off area here and you can see a path that goes across the hill on the right if you are facing out of town. You can see some black rock on the side of the hill that looks like an old lava flow. We parked the car and walked up to the path and started finding round bumpy rocks right near the area of the black lava flow. 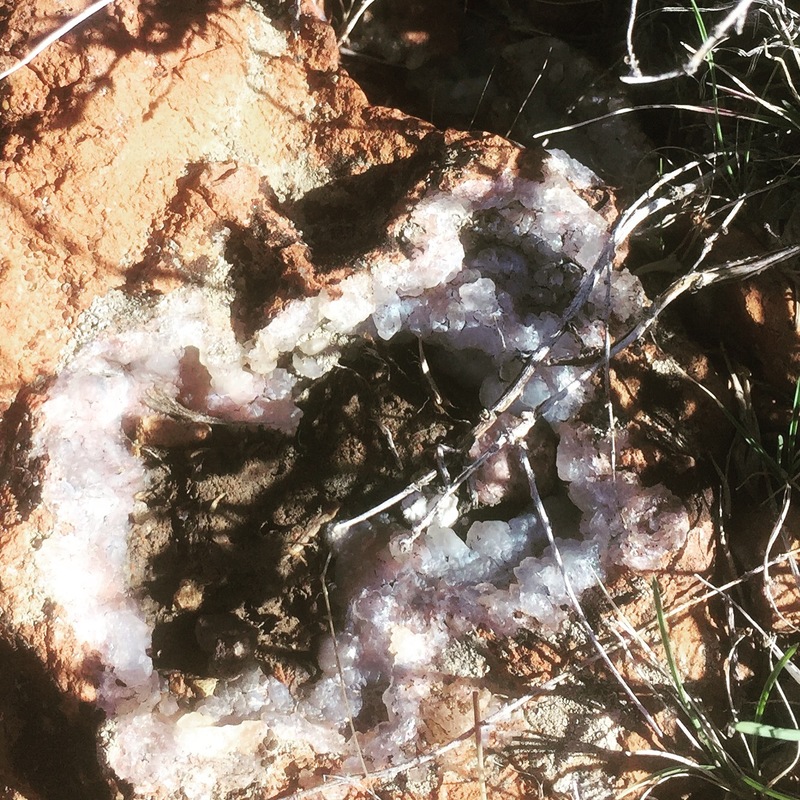 We knew we were in the right area because lots of these rocks were already cracked open and you could see the crystals inside. 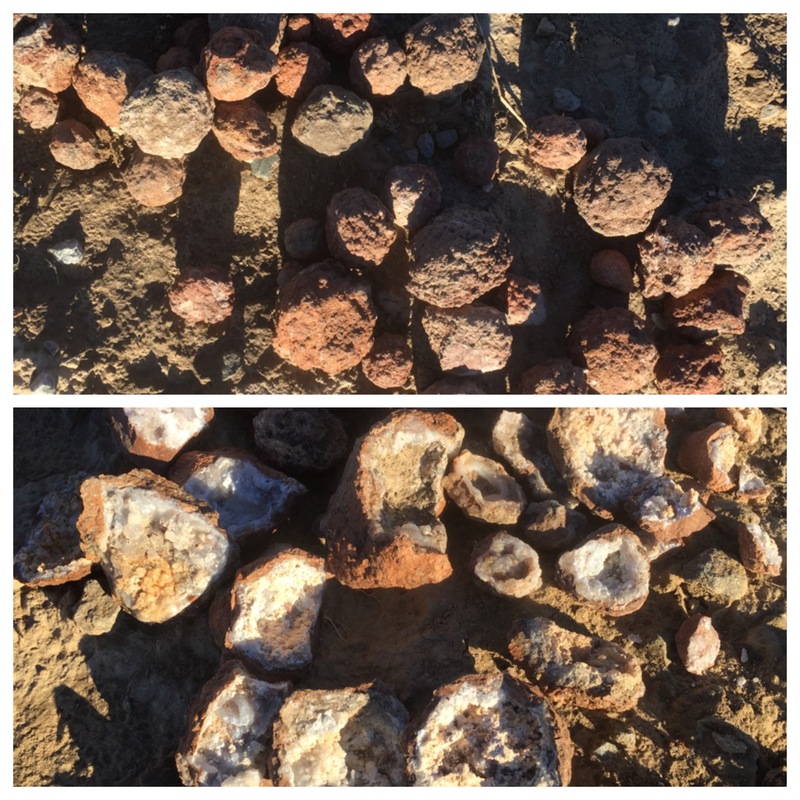 We spent some time gathering up a few of the “lighter” rocks since we had read this is one way you can tell they are a geode and not solid. Once we had our fill of rocks we walked to the top of the hill and took in the 360 degree panorama of the area. It is a beautiful area and we had the place to ourselves. 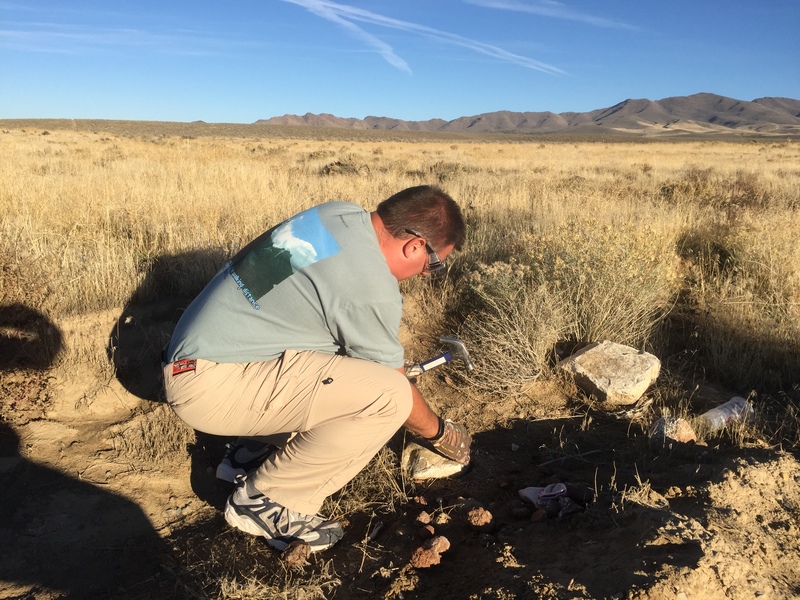 We returned to our campsite, grabbed our hammer and found a secluded site with a big rock to smash open our cache. We had done fairly well for our first try and about 1/3 of the rocks were geodes. We are really enjoying not having plans. It has allowed us to be spontaneous and listen to locals about what to do in their area. Rockhounding is not something we would have planned to do but we had a great time and got to see some beautiful landscapes. 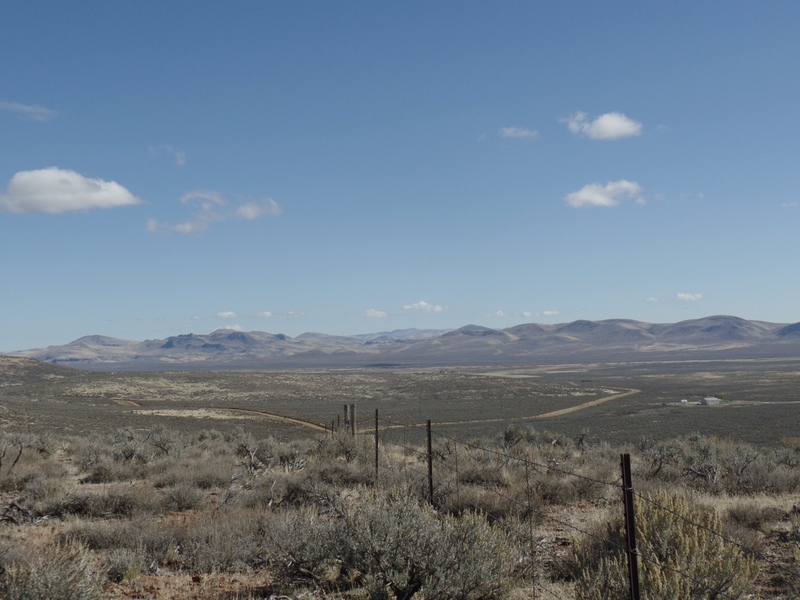 This entry was posted in Sightseeing, The journey west and tagged BLM, Geodes, Midas, rockhounding, Winnemucca. Bookmark the permalink. 1 Response to What to do in Winnemucca? 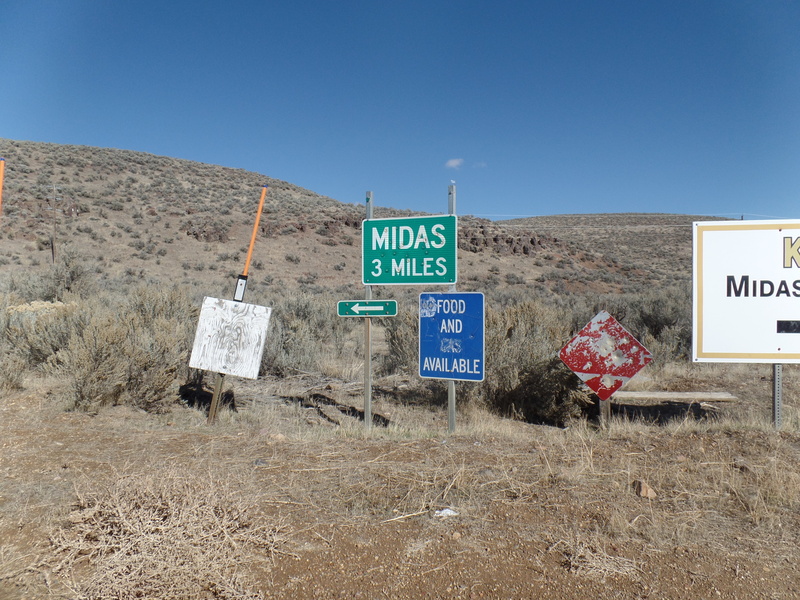 I actually live in Winnemucca and have never been to Midas…now you have peaked my interest. I am a photographer and am always looking for new areas to take photographs of or in. Glad you enjoyed your visit.